Putting the trampoline together wasn't easy, but the instructions were very easy to follow. It's well worth the money and the Grandkids love it. Some of the screws were too short and we had to go buy some more but we finally got it done in the end. Otherwise great trampoline. The kids love it. Easy instructions to get it together. Great tramp for the price. Kids very happy - nice and bouncy! Agree with previous reviewer - we had some issues working out which bolts went where. I googled the instructions though and found them online with colour photos which made things so much easier. Very happy with it .. could do with better instructions. nut once you work out the bolts it's fine. seems pretty good quality so far for the price. happy with it.. children love it. Very happy with it, easy assembly and the kids love it. Very happy, Well made an I can see hours of jumping fun to be had. Can not rate it yet as it's a xmas present. 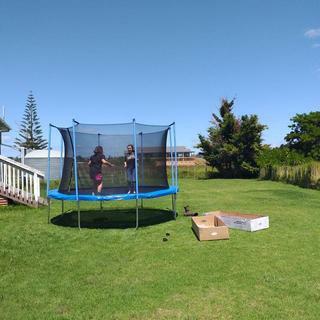 Active intent brand was not delivered but the basic brand trampoline was.